Meet the First Father Daughter Duo to Climb the MOUNT EVEREST. Like Father, Like Daughter: The first duo to conquer the unforgiving yet breathtakingly beautiful, Mount Everest, together! The First Father - Daughter duo to Climb Mount Everest. Mount Everest has been a source of undying inspiration to many. To stand oh so almighty tall and tower over upon us meager human beings, these peaks are known to be unforgiving for their edgy peaks and equal satisfaction in beauty. Many have dreamt of conquering its heights. Many have failed but then there are also many who have survived and lived to tell a tale of absolute legend and beauty. One such tale is the one shared between a father and his daughter. A dream that was dreamt together, was also achieved, with great difficulty but equal strength in each footing. A dream that allowed the eyes of many to open and believe in a higher purpose. This tale is rather a bit off the ordinary track. Because for the first time in history, a father-daughter duo have achieved this legendary feat. It seemed the most unlikely for two such people to come together and revel on this most unexpected victory. 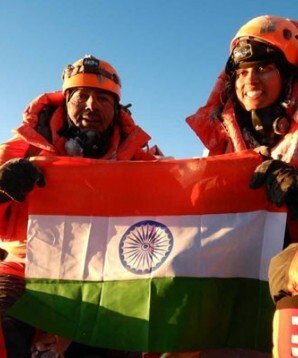 Ajeet Bajaj from Gurgaon, 53, and his daughter Deeya Bajaj, 24, climbed 8,848 meters and set themselves on the record for being the first oddly paired duo to achieve such a stellar dream. They successfully reached the summit of the highest peak of the world and with it conquered all their fears and dreams. The climb was no easy task as it goes without saying but despite the life-threatening challenges, the extreme weather conditions, and the arduous climb, they came back home to rejoice in their victory and pat themselves on the back with pride and wonder. A moment of fear and doubt that occurred amidst the adventurous climb was towards the end when Ajeet's oxygen mask failed to co-operate. There was a moment of shaken belief when everything seemed to be coming down, crashing onto what may have been. Ajeet didn't feel he could make it and determined to not give up, he asked his daughter to go on ahead. They had made it this far. It wasn't the time to hold back now. So walked Deeya, climbed more likely, but she did and she reached the top of the world. The worst was over. The dream, achieved. She was on the highest part of this planet. There was nothing that could shatter her mountain of a confidence and happiness. It came with a sense of almost enlightenment. And to her absolute joy and delight, fifteen minutes later, her father joined her on the peak. Ajeet remarks this to be his highlight of the journey. To watch his daughter embrace the height in sheer beauty and elegance and to see her standing at the top of the world. It gave him, a father, immense pleasure and unmatched joy. The unfortunate episode with the oxygen mask may have taken away from him, the chance to complete the climb together with his daughter. Nevertheless, there was a sense of achievement in watching his daughter and sharing the success of their climb together. The message Ajeet hoped to deliver with this was that women can achieve anything. Even the greatest heights it may be, only if they have the support and push they need. This stands true in every case. Also, if your dream has a genuine factor running for it, there is no way, all of the destiny won't help you work towards achieving it. This is true in the case of Ajeet and Deeya for they now have a story to tell, a story that can change a lot of perspectives.